Hartford Courant, Sunday November 9, 2003. Cold hard cash. The almighty dollar. Market value. Money, money, money. What a lousy way to measure wealth. In his poem “Wealth,” Ralph Waldo Emerson clearly identified the true source of riches in early America. It wasn’t our great cod fishery, tall timber, animal pelts, whale oil or veins of gold. It was soil. Soil formed the basis of this country’s early agricultural society. It provided the bread, butter, bacon and beer that nourished the militia that sent the British packing. That resource — the essence of terrestrial life — was 15,000 years in the making. Only in the past half-century have we dramatically reversed its growth by covering it with America’s favorite substance, bituminous pavement, the sine qua non of modern society. Emerson knew that air and sun are the raw material for photosynthesis, as well as water from rain, snow and vapor. He knew that the leaves of plants drop to the ground and decompose. He knew that, over time, soil develops, thickens and eventually covers the granite crust of the earth. Only then can wheat — his metaphor for the staff of life — nourish humankind. That process described by Emerson was the most important historical development in New England since the melting of the last ice sheet. Cold dry air drained from the dome of leftover ice to the north. Melted snow and Atlantic rains soaked into an otherwise sterile soil, converting glacial grit to clay and rust. Pollen — manna for microbes — blew in from the south. Lichens encrusted the boulders. Mosses, sedges and ground-hugging grasses took root. Strewn dead leaves became food for other windswept plants, then for insects, worms and, eventually, every creeping thing. Wave after wave of life followed, each contributing to the soil in its own way: tundra; coniferous taiga; deciduous forest; livestock pasture and tillage; then, finally, back to forest, which to this day spreads and thickens the soil. First came a tidal wave of tundra that carpeted what the ice had wrought from stone. Shrubs of willow and birch — resembling Japanese bonsai trees, or those forming the treeline on Mount Washington — bravely weathered the harsh winds to anchor the soil, catching more dust. These trees also caught the rain, their roots creating pathways in the stone that allowed the water to seep beneath the surface and quicken the pace of soil development. Mammoths and mastodons drank from small ponds blue as the sky. Next came a forested wave of spruce, fir, pine, hemlock and birch, separated by vistas of grass and sedge. Caribou and moose followed, followed by Paleo-Indians, human predators who roamed the landscape in search of game or harpooned marine mammals along the rocky coast. Many blue ponds turned to peat bogs covered by cranberries and tamarack. Then a third soil-making wave rolled in with surge after surge of oak, beech, maple, ash, hickory, walnut, cherry, elm and others. The resulting soil, richer, helped to feed different woodland creatures – – beaver and deer — along with cougars, bear and wolves. Rinsed free of glacial silt, streams sparked with spawning fish. About 9,000 years ago, archaic peoples moved in and stayed for millennia, leaving behind their seasonal camp sites, fishing gear and shell middens, most of which are now submerged. Many bogs became forested swamps, either blazed by red maple or crowned by Atlantic white cedar. The fourth wave crept upward into rocky estuaries, not unlike those of today’s Maine coast, creating wet soils ahead of the rising sea. Then, about 4,000 years ago, the sea slowed. Gray clam flats formed, as well as tan-colored beaches and green reedy marshes in bays and rivers kept free of trees by seasonally standing water. With this change came a new wave of humans, of Algonquin origin, who named their great rivers the Housatonic, the Connecticut, and the Quinebaug. Known archaeologically as the Woodland Indians, they gathered and hunted from seasonal riverside villages, stored food in chambers and made earthen pottery. Then, a few thousand years ago, they learned to till soil and grow crops on lands enriched by deposits of river silt. The next wave of immigration came from across the Atlantic. Beginning with the Vikings at the turn of the 10th century, wooden ships began probing Connecticut’s coast and its rivers. Then, during the four centuries after the arrival of the Pilgrims in 1620, there was an unbroken wave of exploration and immigration — and exploitation of the soil that, for all their ingenuity and power, these settlers were unable to ruin. At first, they drained and plowed the ribbons of marsh, converting them to square patches and strips. Hay, wheat, barley, oats and orchards replaced marsh and meadowland. Within a century, their descendants moved inland and uphill, felling the forests, replacing them with park-like pastures grazed not by ice age beasts, but by herds of cattle and sheep. Next, in a spectacular reversal, most of these upland pastures, which had been cleared of stones for generations, were abandoned. Tens of thousands of New England sons and daughters walked away from the fields of their childhood for what they hoped would be a better life somewhere else: the industrialized cities, the stone-free Midwest or the gold fields of California. The fields they abandoned filled first with wildflower weeds, then with oaks and pines in sandy pastures, beeches and maples in moister ones, and hemlocks in shady glens. The soil had survived in most places through it all. Only within the last century — only since we learned to inject fossil fuels into our engine veins — have we been able to scrape and cover the soil to the point of no return. New England soil, it seems, has the power to recover from anything Nature can throw at it — glaciation, dune-forming winds, hurricanes, meteorite impacts. Only we, it seems, have the power to do what nature cannot. Within the past half-century, we have covered the soil with bituminous pavement and other impervious surfaces faster than glacier may have paved the land with ice. In our rush to pave, we are destroying the true source of our wealth: the soil. We won’t starve as a region, even if we cover every inch. But there is a need to plan. Other than locally grown food, the principal crop for today’s soil is trees. Collectively, the patchwork of parks, land trusts and undeveloped acreage produce what are called “ecosystem services.” For the simple price of letting trees grow, they stabilize the land surface, reduce flooding, enhance recharge to our aquifers, recycle our airborne pollutants, moderate our climate, provide habitat for all kinds of creatures, and delight our senses with the sights, sounds and smells of lush forest. With each acre of woodland lost, the state looks and feels more like an abandoned parking lot: hot and dry during summer, bitter windy-cold during winter, and always gray. 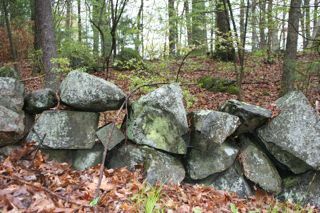 Photo: Generic stone wall as a result of forest conversion.